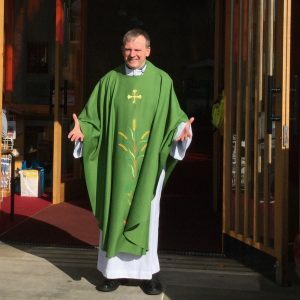 Fr Eddy was born in Nottingham in 1964 and was baptised and brought up a Catholic attending local Catholic schools and serving on the altar in his home parish. After completing school he studied Civil Engineering at University and worked for two years for a local authority in the south of England. He was accepted as a student for the priesthood in 1987 and studied at the Venerable English College in Rome. Ordained in 1993, he served as a curate for a year before being appointed Secretary to Bishop James McGuinness. In that role he travelled around the Diocese including a number of visits to SSPP. After helping Bishop Malcolm settle into the Diocese he served as Parish Priest in St Peter’s, Leicester (2001-11) and Holy Souls, Scunthorpe (2011-17). His interests include sport (especially football and cricket), walking, travel, and current affairs.